Turkish authorities have detained three people linked to last year’s deadly attack on a Berlin Christmas market, local media reported Monday, saying the suspects were headed to Europe. Tunisian attacker Anis Amri hijacked a truck on December 19th, killed its Polish driver and ploughed the vehicle through the market in a attack claimed by the Isis terror group that claimed 11 more lives. The assault left 56 others injured. Turkish media including the website of leading daily Milliyet said the three suspects, German citizens of Lebanese origin, were detained by anti-terror police at Istanbul’s main Ataturk airport. 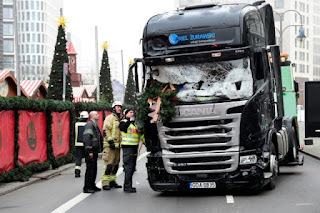 The reports did not specify what their alleged links to the Berlin attack were, but cited intelligence that said the three wanted to go to an unidentified European country. Four days after the December attack, Amri, 24, was shot dead by Italian police after he fled to Milan. One of those arrested at the airport had been waiting to go to Europe with the intention of launching a terror attack after he had entered Turkey illegally, the reports added. Separately, a German citizen of Jordanian origin allegedly linked to Amri and believed to be an Isis member was caught in the Aegean city of Izmir on March 11th, state-run Anadolu news agency reported. Turkey has been hit by multiple attacks blamed on Isis in the last 18 months, including a gun attack on an Istanbul nightclub just 75 minutes into 2017 which left 39 dead. Many foreign extremist fighters in Syria made their journey to the war-torn country via Turkey prompting Western allies to chide Ankara for not doing enough to halt Isis militants. But Turkey has stepped up its security on its 911-kilometre (560-mile) border with Syria and officials insist the country has done all it can in the fight against Isis.